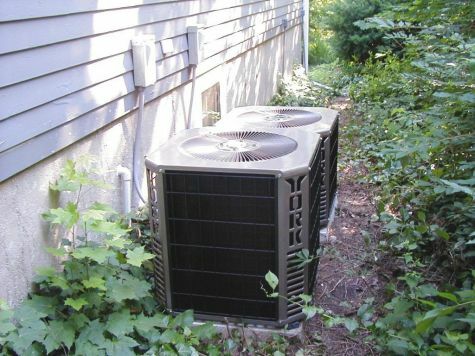 Two York Air Conditioning Condensing Units. We custom fit these Runtal radiators into this cabinet which has a copper lined window planter on top. 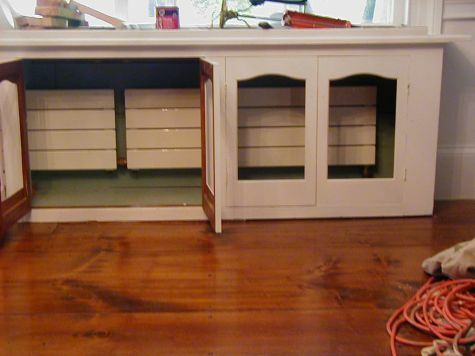 The cabinet doors were inlayed with stamped tin plating. Located in the historic dining room, this provides a modern, yet completely hidden radiator. Runtal Radiator Panel for the dining room. 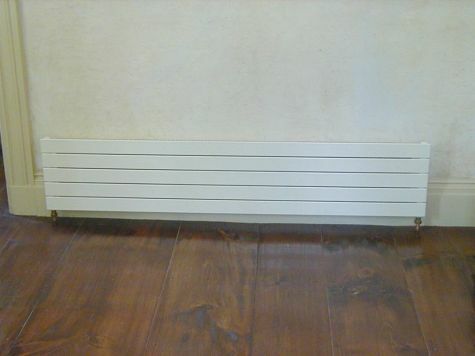 These are low profile baseboard Runtal Radiators that are shorter than the old trim. These radiators can be custom painted to match the trim. 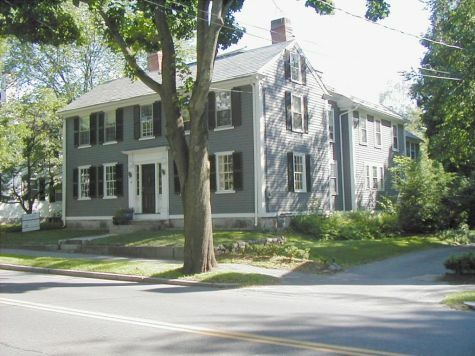 Complete restoration of heating system and additional installation of central air conditioning during a historic restoration in Concord, Massachusetts. 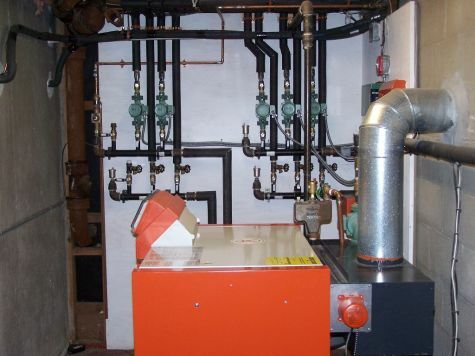 This home previously had a derelict oil fired steam system and a separate oil hot water boiler. It was uncomfortable and very expensive to operate. 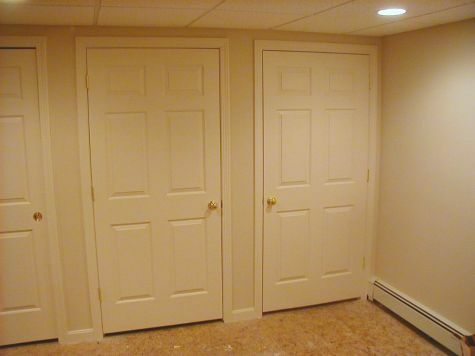 Here in Massachusetts, we build things to last. Some of the first battles of the American Revolution were fought near this home over two centuries ago. With a new state of the art heating system, we believe it’s ready for at least another century. 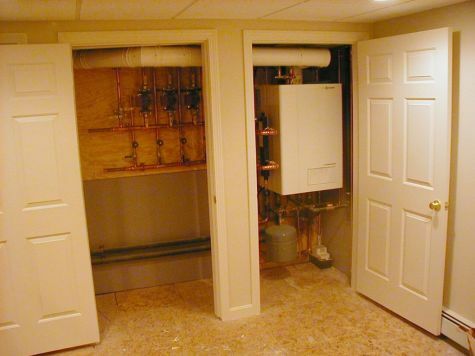 This photo shows the Viessmann Vitodens hidden in the closet. Zone damper control system from EWC with freeze sensors, is also installed in existing closet. The amount of pollution produced has been dropped dramatically – so much that the gas company replaced the gas meter because it used so much less gas that they thought it was broken! This home was approximately 10-15 years old, and it contained two hot air gas furnaces and a direct fired, gas water heater. 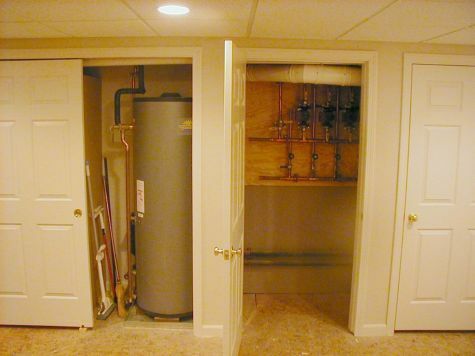 We replaced these items with an indirect water heater, two hydro air units (in place of the gas furnaces) and powered all with a Viessmann Vitodens boiler hidden in these closets that are part of a new finished basement which we are heating with baseboard. We also installed a Mitsubishi mini split AC system for the basement. We installed zone dampers to make the house four zones instead of two, and upgraded the SEER level of the condensers from 9 to 12 SEER for a 20%+ reduction in electrical consumption.